Hamilton was the premier American-made watch manufacturer and their watches commanded a premium price. Although some models were within the reach of "the common man", you needed deep pockets to afford Hamilton's higher end models. Even the names of the high end models bespoke elite status, as several were named after swanky country clubs of the period. For example, one of the most popular models is the Piping Rock, sometimes referred to as the Augusta of the early 20th century, although it's located in New York. Another example is the 1928 Meadowbrook, which I believe was named after the private country club near Northville, Michigan. 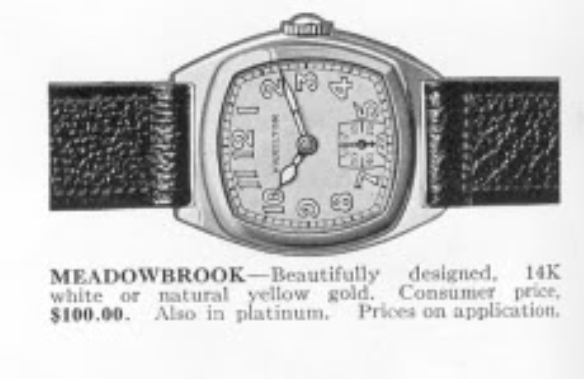 The Meadowbrook came in 14K yellow or white gold, and if you really wanted to spice things up it came in platinum too. You had your choice of three dials... an exploding numerals luminous dial, a more traditional luminous dial, or a "raised gold figure" dial. 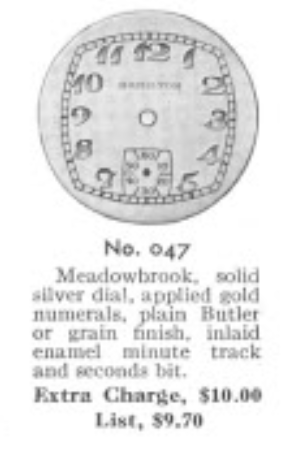 The latter preceded Hamilton's eventual adoption of the "applied gold number" dial nomenclature. The exploding numerals luminous dial is arguably the most popular with collectors - although the raised gold figure dial was an upgrade for an extra $10 at the time. In 1932 a very similar model was introduced called the Oakmont - another famous golf course near Pittsburgh. 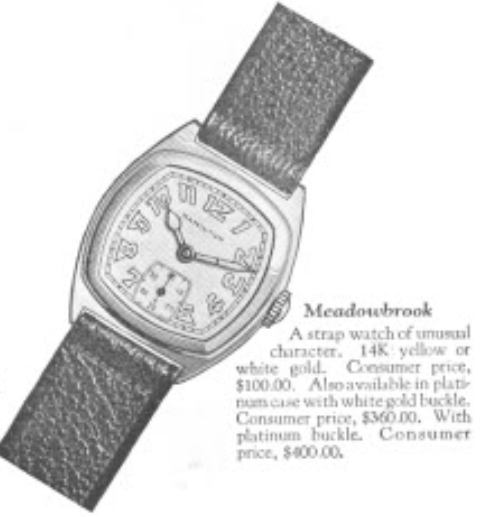 It looks almost identical to the Medowbrook except the shape of the case sweeps towards the lugs differently than the Meadowbrook. You can compare the two catalog images below. 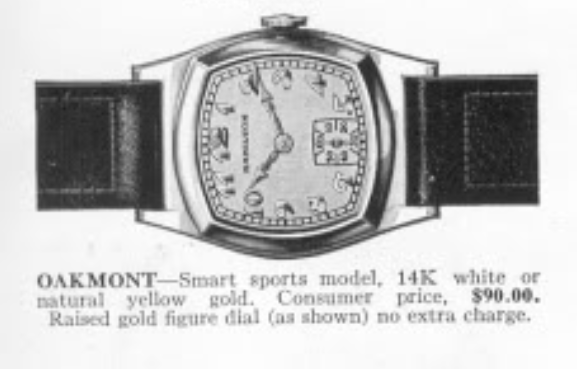 It's interesting to note that the Oakmont was priced less than the Meadowbrook and you had the option of the raised gold figure dial at no extra charge. 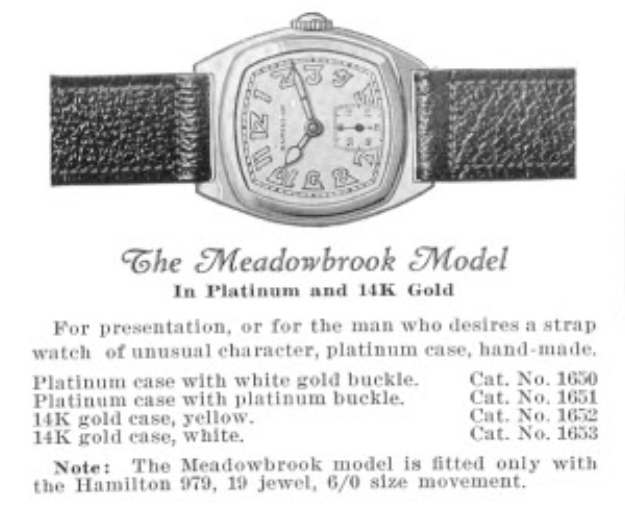 If you had especially deep pockets at the height of the great depression, why not get the platinum model for a mere $360... heck, get the platinum buckle too for a total cost of $400. That's just $5,700 in today's dollars... and the buckle was a $570 add-on! Needless to say, not a lot of platinum models were made... 17 to be precise. They made 1,274 yellow and 1,494 white gold versions over the period of production. Cadillac also procured 193 yellow and 269 white specially inscribed Meadowbooks to use as awards and those are actually very highly prized by collectors due to their added scarcity. I recently received a Meadowbrook project watch in need of a little TLC. It was in running order but definitely needed a thorough cleaning. You can see that the center section of the case has male lugs instead of holes. So the installation of a strap requires female spring bars. The crown on this watch is white in color and stands off from the case a little too far. I should be able to change that out with a better option. The project watch has the raised gold figure dial, known as dial no 047. It's a plain butler finish with engraved minute and seconds tracks. That means this dial can be perfectly refinished today, if it needed to be, as the printing goes right into the engraving on the dial. The back has a presentation from Naomi to Donald, August 19th, 1931. Kind of makes you wonder what the circumstances were. Was this an anniversary present, wedding present? The answer has been lost to time. The first step in the overhaul process is to remove the bezel from the case's center. This is a three piece case... front bezel, center and case back. The movement will come out the front once the case screws are removed from the back. The back pops off just like the front bezel. Once the stem and the two case screws are removed the movement is free to come out. I just have to make sure I don't drop the movement as it slides out the front. The 979F is the best movement Hamilton made in the 1930's as far as wrist watches went. It shares many parts with the 987 series but has a couple of minor upgrades like two extra cap jewels, extra winding wheels and fine damascening. Although the movement appears to run and keep good time, notice that the regulator is at full fast. That could be a sign that there's an issue within. We'll see what a cleaning does to the timing. This watch already has a white alloy mainspring installed. So I'll remove it and clean it since it won't be set like an old blue spring would be. Everything is cleaned and dried before reassembly. These 1920's and 30's movements can be very challenging. They are straightforward but can often be troublesome due to the extra miles they might have on them. The now clean movement is back to running nicely. Now it's off to the timer to check it's accuracy. It's running a little fast, as you might expect from the regulator position. But what's up with the wiggly lines? The amplitude is well above 300 degrees so the waviness is a bit odd. A slight tweak to the regulator slows the beat rate down but the continued waviness is still a mystery. When all else fails, the first thing to try is the demagnetizer. It won't do any harm (nothing in the watch should be magnetized) and once it's demagnetized I can move on to other potential causes, like a wobbly escape wheel or bent pivot somewhere. The demagnetizer did the trick though... now the watch is running fast again but it's much more consistent with equally good amplitude. A more significant tweak to the regulator brings everything right in line... not too shabby for an 80+ year old movement. Here's a shot of the movement and the position of the regulator, post servicing. The dial and hands go back onto the movement and it all gets buttoned back up on the case. I installed a better crown - at least this one is yellow. It still stands off a little from the case and I'm tempted to shorten the stem but the stems in this movement can be very tricky... a little too long is better than a little too short - so I'll leave it as is. It's still an improvement over what I started with and it works as it should. From the side, the crown is a much better looking fit and matches the case very well. I like the Meadowbrook. It's a substantial watch by vintage standards. It's not an inexpensive watch though so if you're inclined to have a small, but very nice collection of Hamiltons, this is a great model to include. Otherwise a Meadowbrook can put a significant dent in the collection allowance. Lancaster native and now Michigan resident, here. I'm not sure Meadowbrook Country Club was famed at the time, but it surely existed. It's also worth noting that it's a common name for random things in Lancaster county - including a street adjacent to Wheatland, fairly close to the Hamilton factory. That's been a nice part of town forever, and a just-as-likely explaination is a designer or someone lived there.